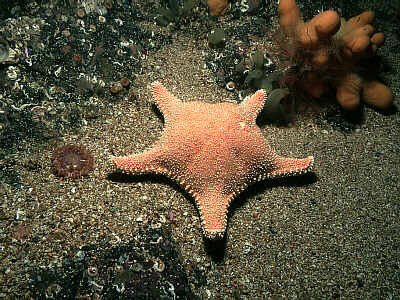 Habitat: Little known, apparently lives on flat sediment bottoms, feeding on other Echinoderms and on bivalves. Distribution: Rather rare in the British Isles, found in Scotland and the Shetlands and in the North Sea. Similar Species: Porania pulvillus is similar in shape but not in texture. Short arms and large body. Red colour with white tubercles. Picton, B.E. & Morrow, C.C. (2016). Hippasteria phrygiana (Parelius, 1768). [In] Encyclopedia of Marine Life of Britain and Ireland.